So in he comes with 72 coins that he purchased from RCNH. I explained what CAC was all about and we sent them out for him. Just one CAC could easily pay for all of the grading fees! Here are the results; 67 of 72 coins CAC’d which is 93%, one even gold stickered and I thought more should have. 23 of his coins came from other sources. 15 CAC’d and 8 didn’t, still a very respectful 65%. When he bought from others, he tried to incorporate the information he received from us over the years about grading. Over all he did very well, 82 of 95 pieces for a total percentage of 86%! This earned him tens of thousands of extra dollars. These were not all common coins by any stretch. As an example or two, we sold him the one and only 1847 PCGS MS-66 Seated half, it is now CAC’d. A beautiful 1916 PCGS MS-67 Walker that now has a CAC sticker. A superb 1812 Bust half in MS-65 PCGS that now has a sticker, and down the line. In other words, this was a significant collection! I know I’m preaching to the choir, but who you buy your coins from can be more important than the coins themselves! If you are thinking of selling or just want to acquire the best available coins for the grade, call or e-mail us at your convenience. I think you’ll be glad you did. By the way, most dealers would kill for an 86% average at CAC! I’m a bit disappointed that only 93% of ours stickered! I was contacted by a customer recently that had a 1929 $5 Indian, great date and something I would buy in any state of preservation! He tells me he brought a collection to another dealer that was passed down to him by his father. He showed the dealer the 1929 $5 and the dealer said he does not buy gold coins!!! However, it’s very valuable and he should take it to another dealer. So he makes an appointment with me. The coin comes out of his pocket in a protective holder and I could tell it was a copy at arm’s length. I said the coin is a fake and I can’t believe a dealer would not know it! He asked me how I could tell…I said that $5 coins are not the size of a half dollar; they are closer to a quarter. If that’s not enough, when you look at it closely, the word copy is visible to the naked eye!!! The dealer that he showed it to has been in business for a long time too, I mean decades. I’m sure he got all the money he could for his family’s collection…all I can say is WOW! Speaking of WOW, PCGS appears to be in a changing of the guard mode. I hear that David Hall is no longer working there. I don’t know the reason, but it could be that stockholders are becoming more concerned about running PCGS like a business. For years, dealers and collectors have complained to me about grading favoritism. I don’t know if that’s the case, but it looks like people won’t have to worry about that now. I’m sure more information will be coming soon. Has PCGS Tightened its Grading During the Past Few Months? When I read this post on the PCGS message board I found it rather disturbing. At RCNH we have always viewed our role in numismatics as being custodians of the coins that we handle. Are we in business to make money? Absolutely, but we make money in a fair way, not by expecting our coins to be over-graded. Let’s examine the posted question and answer. First, the question. I view this as discontent by the poster because they must not be getting the anticipated grades on submissions. When speaking with dealers and collectors who complain about not getting grades they wanted, in my experience it usually boils down to two things. First, they paid too much for a coin, anticipating that the coin would upgrade and it didn’t, and then they blame PCGS. Second, the submitter just plain can’t grade coins or the series of coin that they are complaining about. Grading comes with experience and mind you that just because someone has been collecting coins since Noah built his Ark or can sell coins to people less knowledgeable, does not mean they can grade coins. Summer is in the rearview mirror and the fall season is upon us, right on schedule. I mentioned earlier that this was one of the busiest summers that I can recall since the almost 30 years that we’ve been here. It just seemed like people armed with many boxes and cases of numismatic material were marching in on a daily basis. I’m not complaining as that’s what keeps the engine running. Most of the material that comes in is just stuff that gets wholesaled and moved down the line, but a small percentage of this material is nice enough for us to offer to our customers. Warren was fortunate enough to purchase several collections that had some nice original Bust half dollars. Enough so, that we felt we should run an ad in Numismatic News and happily it brought several collectors out of the woodwork. It’s great to meet new collectors and put some nice original pieces in their hands and also to get “Want Lists”. We have been receiving notifications from The Numismatic Crime Information Center for several years now and I’m noticing that we’ve been getting a lot more notifications than ever before. I don’t know if it’s because more people are aware of the service and are bringing illegal activities to their attention or if there are more numismatic crimes being committed these days. It just means to me that crime doesn’t take a day off and you just have to be aware of what’s going on around you, especially when you’re showing your valuable coins to more than one person at a time. On a lighter note, over the course of a few weeks we accumulated a lot of modern face coins. The bank we are located in doesn’t have a coin counter, so I’ll take the opportunity to take a break and get out of my office to take the change to our sister bank on the other side of town. They used to have a coin counter that was constantly problematic and for the longest time they dreaded seeing me come in with several hundred dollars in change, because they knew there was going to be a problem. They finally got a new coin counter and now the process is a breeze since they can count hundreds of dollars worth of coins in a minute. I was in there the other day and was speaking with a young lady that was assisting me and she told me of a good story. Apparently a lady came in with a very large container of coins. When they ran the coins through the counter it came to an abrupt stop, which means that there was probably a foreign object restricting the flow. They went to clean out the restriction and found a diamond ring. The lady that brought in the coins was overjoyed. She said that she had lost her wedding ring three years ago and had looked everywhere for it until she had exhausted all the possibilities of where it could be. It must have come off her finger when she was dumping some change into the container and it took three years before she had enough change to take to the bank. I love it when something nice like that happens. The three Chinese coins have come back to us and I have been able to inspect the holders. We get fake coins almost every week, some very obvious and poor attempts, others requiring some close inspection. The gold coin was suspect immediately, but to be on the safe side, we submitted the three coins to Heritage. It took about three weeks for the call from Heritage with the news that the coins and holders were counterfeit. I have had a chance to inspect all three. Two of the holders are copies of PCGS version 4.5S. This version has the words PCGS Secure Plus in blue repeated in very small type in the border, giving a textured appearance to the label border, which under magnification reveals those words. The third holder has the obverse label of the PCGS version 4.6S, but the incorrect reverse hologram. 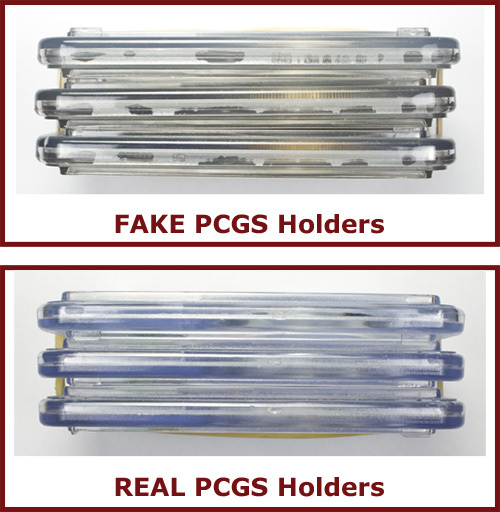 In addition, upon close inspection of each holder, there are obvious gaps in the seals, indicative of an attempted glue seal, not the PCGS sonic sealing which leaves no gaps. The PCGS in the Secure Plus Shield is not centered, but is left aligned. I thought this might be another issue, but I have found shields with the PCGS aligned left on authentic holders. However, the PCGS in the shield has the letters outlined on the authentic holder; the fake does not have outlined letters. Also, the shield has PCGSSECUREPLUS printed around the edge in very clear letters as a border, while the fake border is a just a line with no details at all. 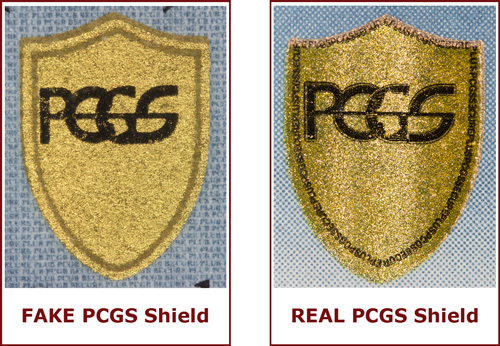 The authentic PCGS Secure Plus shield is a bright reflective gold, the fake shield is dull and flat gold color. Also, notice how much clearer the Liberty Head (facing left) is in the G of PCGS on the Secure Plus Shield of the authentic holder than on the fake. It may be only a matter of time before the weaknesses in the copies are improved. On the other hand, it may not be worth the effort and cost to make the copies nearly perfect. We need to stay vigilant and learn as much as we can. Experienced eyes can often spot a counterfeit coin almost immediately. Some coins may be a challenge. These holders turned out to be very weak copies. The three coins had mushy details when compared to real examples in recent auctions. For those of us who do not have 40 years of experience looking at coins, it is a good idea to look up authentic examples on the PCGS site COIN FACTS, or check out recent auction results. In addition, seek the knowledge of an expert. Lou Roten - adjunct instructor emeritus - mathematics / physics, Franklin Pierce University; environmental scientist; fiddler; life-long interest in collecting coins and stamps with some interruptions; very interested in the evolution of the coin making process. Answer: Thanks for your thoughts G.L. Admittedly, one man’s Poor-1 grade could be another man’s Fair-2 to grade. However, I think that a coin at any grade can be easily determined to be high-end or low-end for the grade. In poorer grades wholesomeness is key. By wholesome, I mean coins that wore down on their own, they were never cleaned, damaged or enhanced in any way. The blessing that CAC is trying to bestow on lower grades is that they are appealing too! Many collections put together low-end graded registry sets. The assurance that your low-end coins pass the CAC muster, does increase demand and liquidity, which is not a bad thing! I do believe that there is a use for CAC in all grades from poor to superb uncirculated. Coins below XF especially can be subject to cleaning, alteration and damage. The more worn down or the lower a grade a coin is, means it was subject to more potential abuse. To me a wholesome, appealing, above average coin in any grade is what a true collector should focus on. Also, I must disagree with your statement about CAC’s focus is on originality. I have taken them to task in this newsletter and others where I’ve been quoted for CAC stickering non-original coins. Many dipped coins are CAC’d because they have commercial appeal. This to me is wrong, period. If a coin’s integrity has been compromised, that’s a negative in my book. However, regarding your statement about coins being softly struck, lacking luster and having significant marks, these are indeed factors that must be considered for grading. Balance must rule the day in grading. A softly struck coin may have booming luster and be very clean. Or a lack luster coin may have a superb strike and a clean surface, balance rules the day. Some collectors won’t buy a coin that doesn’t have a full strike, and obviously in some series, they will never buy many dates. I had a collector call me and said that he only buys MS-64 coins with no marks! Yet the primary deterrent to locating high-end coins is surface abrasion. I had to tell him he is missing hairlines and wipes. Bottom line is that it’s about time that a company is willing to step up to the plate and be willing to identify high-end for the grade coins. We’ve been saying this since 1990, now that a creditable firm does it, I’m all in. More money and added liquidity convinced me!! !